I believe that rebuilding history is of vital importance. And in this work of rebuilding and understanding history it, should be mandatory to include the history of the Romani people, and not as an isolated phenomenon but as one that is integrated into the history of Catalonia, Spain, Europe and the world. We must carry out a critical review from different paradigms and from the perspective of a people and shine a light on the footprints and cultural richness that we Roma have left over the centuries. This demand has certainly not been included within recent political and social trends in Catalonia and Spain. We should consider this present moment as a time for Roma to claim our right to dignify our own history. Preferences in regards to social policies for the Romani people have never been decided by Roma based on our own analysis of our needs, but have rather been determined in a top-down manner. Policies affecting Roma should not be limited to mere acts of recognition. Recognition is positive, but efforts of a more cross-cutting nature are needed. Although the recognition of our culture and history should be the first step, it should be accompanied by a series of effective policies in other areas, because otherwise real social transformation will never take place. I was born into the world of Romani associations. My father and a few of my uncles became involved in Romani activism in the 1960s. After more than 25 years of work, I have seen many political changes and consider myself a veteran. And with the permission of those reading this, I will take the liberty of expressing myself in a direct and simple way. Many associations have been working for decades on vindicating and working for the Romani people. We have lived through a number of political phases as well as different working approaches, including: re-education, welfarism, paternalism, outside management of our own processes as well as providing guidance and taking decisions for us as if we were children. Many of us have for several decades called for the historical recognition of Roma in Catalonia without receiving much support. We have over these decades justified a thousand times the need to recover and rebuild our history only to hear responses such as: “Don’t look to the past, look to the future, looking to the past will only stir resentment”; “they are always leaning on the victimhood of historical memory. That was many centuries ago, so they no longer have any excuse not to become integrated”. And those of us who have fought for this cause are portrayed as being a segment of Romani society that is socially radical, retrograde and fundamentalist. But different waves of thought have emerged over the past few years in the European Union that have led to new forms of activism, challenges to the current economic model and a crisis regarding the values ​​of our society. With these trends have also come attempts to regain all that the individualistic system has taken from us, and hence new approaches to achieve a more community-orientated society. Today I am pleased because, thanks to these new social trends, we may no longer be looked at in askance when we assert ourselves; there will no longer be any excuse for them to say that asserting our identity is the same as immersing ourselves in a culture of complaint. We can forget about fear and say emphatically that we need tools to help us preserve our community-based culture within an individualistic society without being labelled as backward-looking or being accused of having an anti-integrative mindset. For us the economic crisis did not begin in 2007 but much earlier with the decline of our trades, our exclusion from the labour market and the mutilation of our traditional markets. We Roma are quite accustomed to being made to feel that our social realities are not only invisible but have second class status within established political agendas. Furthermore, we feel helpless to defend our points of view, as they are oftentimes not the least bit understood. We are so invisible that our realities do not seem to exist until their effects are felt by other groups or minorities. The worst kind of discrimination a people can suffer is to be ignored. If you are ignored then you do not exist; if you do not exist, there is no past and nothing needs mending. For example, in recent months we have seen political and media attention given to the treatment by police of street vendors of African origin in Barcelona as if this phenomenon was exclusive to and had just come into being with the arrival of African immigrants. Not so. Long before the arrival of African street vendors to Barcelona, ​​hundreds of Romani men and women with no way to access the labour market made (and still do) make a living selling in this manner. Apart from suffering from the inherent precariousness of such situations, we felt alone because no one ever raised their voice on our behalf (I extend my respect and solidarity to African vendors). I believe that now is the time to reflect and assert ourselves. But more than anything else, it is time to be proud of our ethnicity, to feel proud of having been born Roma. My tribute goes firstly to the first Romani women who, in the 12th, 13th, 14thand 15th centuries, took part in the diaspora from the Punjab region of the Indian subcontinent to the Iberian Peninsula. They were the authentic Europeans and had a borderless sense of Europe and the world: anarchic, lovers of freedom, freed from attachments. To Romani women who struggled for centuries to preserve their identity as independent, hard-working women with their own economies, sense of savvy and freedom, and their own idiosyncrasies. Visible in public spaces, they were misunderstood and stigmatised throughout history. And throughout the centuries they suffered from all types of abuse, aberrations, and pragmatic decrees calling for their annihilation, assimilation through repressive laws and re-education. Particularly in the 17th century, Romani men were sent to the arsenals as slaves while the women were imprisoned in what were known as Casas de Misericordia (Mercy Houses). There they staged riots and protested naked when separated from their families. Yet they preserved their identity through chameleonic resistance, sometimes through scandal and other times in silence. Today we women must continue to feel and be Roma. To those Romani heroines imprisoned in the Auschwitz concentration camp in Poland who, on 16 May 1944, realising that all Roma would be exterminated in the evening, led a riot and fought against the SS soldiers, preserving their own lives and those of their families for a little while longer. In remembrance of: Francisca García, a Spanish Romani woman who was imprisoned during World War II at a Nazi concentration camp in Germany. Francisca, better known by her peers as FRASQUITA LA GITANA (Frasquita the Gypsy) according to an account by Neus Català, was described as a very good woman. Frasquita did not want to be referred to as a Roma because she was well aware that as a political prisoner she had a chance at survival, but not as a Roma woman. And of course, those who lived through the Civil War and the Franco dictatorship and endured all kinds of aberrations from the system and the Guardia Civil decrees: the famous pot kicking by civil guards in Roma camps, torture, head-shaving, prisons and so on, and so on. 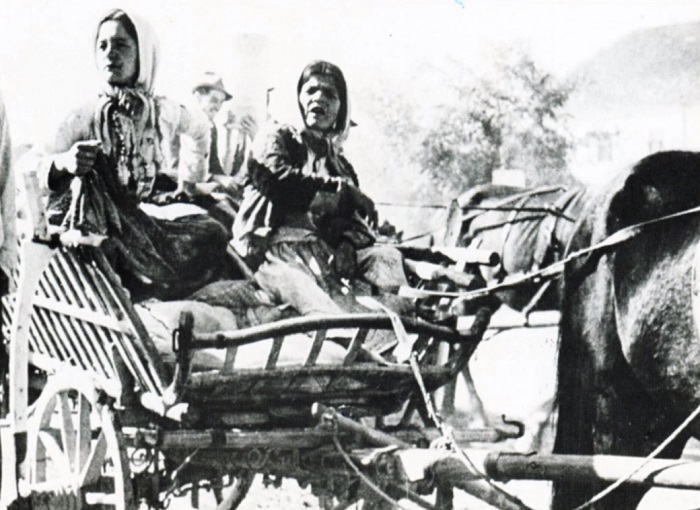 The many Romani women who were victims of forced ethnic sterilisation and the theft of their children by the governments of countries such as the Czech Republic, Slovakia, Hungary and Sweden. To those who only a month ago appeared in the media because a group of football hooligans had derided and harassed them in Madrid. To the victims of human trafficking in Eastern countries. To all victims of gender violence of any origin and culture, but especially to the 5 Romani women who have died this year. To our ambassador par excellence from Catalonia, Carmen Amaya, for showing off her Romani art internationally, and proudly proclaiming her Romani heritage. To our most international Catalan Romani painter Lita Cabellut: thanks for capturing your marginal and ethnic identity in your art. To the brave women who have appeared in art over the centuries – in works by Bosch (El Bosco), Goya, Julio Romero de Torres, or Isidre Nonell – because images of the past can destroy the stereotypes of today. To heroines who find themselves running from the police on a daily basis as they attempt to put food on the table for their children. To those who, due to lack of education, have no choice but to work in low-paid and precarious jobs as housekeepers. To heroines living in difficult neighbourhoods who – despite being structurally condemned because of their social and ethnic status to being educated in segregated schools and struggling against thousands of barriers and stereotypes from both the outside and inside – still manage to complete their SECONDARY EDUCATION. To the many Romani people working in the social sphere who break their backs every day. Because of them objectives are met, but they must doubly prove their professionalism and have their Romani work methodologies constantly called into question. To those women who are subjected to racism on a daily basis in shopping centres, and who within the labour market are pressurised to hide their Romani identity. And also to those who courageously decide to live openly as Roma and silently put up with all manner of stereotypes and labels. And also to all those Romani men – fathers, brothers, grandfathers and uncles – who support us as we strive to achieve gender equality. To non-Roma experts and professionals who support us on our journey to achieve equality, and who work shoulder-to-shoulder with us but always follow one step behind, because they are aware that we are the ones who must take the first step. To those women with the skills to situate themselves in different contexts and fields and who work to meet the needs of our society and culture. To those women who participate in the majority society and also strive to keep their heads high in order to avoid being absorbed by the system, and who feel proud of their identity and help move it forward while at the same time transmitting it to others. We see all things the same way but experience them differently. Your people are strong, while mine are weak, because we have no science or memory. Maybe it’s better that way, because if Roma had memory we would die of anguish. Opre Rromnia thaj o gao Rrom!